This beautiful Sailfish tabletop fountain will draw everybody's attention. 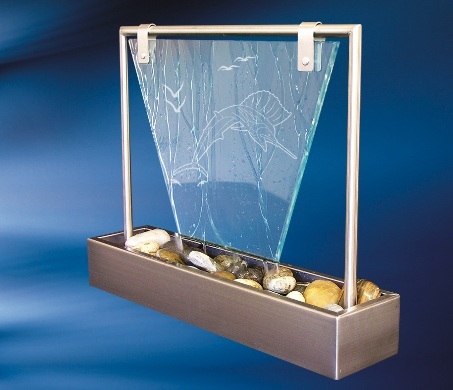 It is hand-crafted in Australia and features glass engraved sailfish and birds panel and stainless finish. For the final touch river rocks are placed on the rock tray. This fountain creates an environment of relaxing tranquility wherever it is placed, it covers distracting ambient noise, help raise alertness and focus.